Unlike the Call of the Archons Starter Set, this set does not include two standardized learning decks, and you'll also discover that stun and increased power are now marked by tokens rather than status cards. Both the Call of the Archons Starter Set and the Age of Ascension Two-Player Starter Set provide excellent points of entry for new players, and as the game continues to grow, the power is with you to choose the option that’s right for you. Once the Age of Ascension set lands at retailers in the second quarter of 2019, you'll be able to track your Archon Decks from both Call of the Archons and Age of Ascension in the Master Vault at KeyForgeGame.com. Here, you can track your decks and see how they fit into the meta at large, follow the performance of other Archons across the Crucible, and stay updated on tournaments and events from Fantasy Flight Games Organized Play. 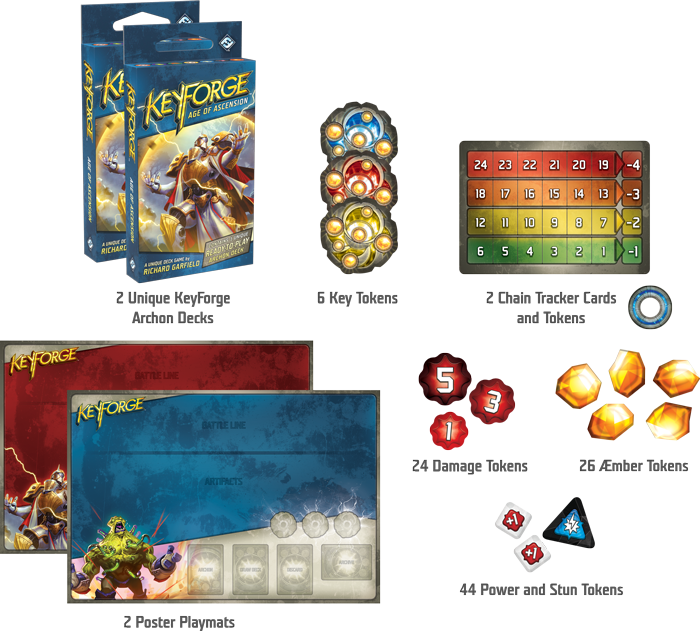 As KeyForge continues to evolve, so too will the Master Vault, so keep an eye out for what secrets are emerging!